Tranent & District Community Sports Club brings together Tranent and district community sport clubs with a real passion for developing and involving the community in the development of sport and activity of Tranent. Tranent & District Community Sports Club was formed in 2011 with the purpose of working with East Lothian council to help improve the quality and accessibility of sporting facilities for all sports through out the region. We have also made it a priority to Improve and promote the well being of youngsters and adults alike, with a goal to improve their social skills and promote healthier lifestyles. 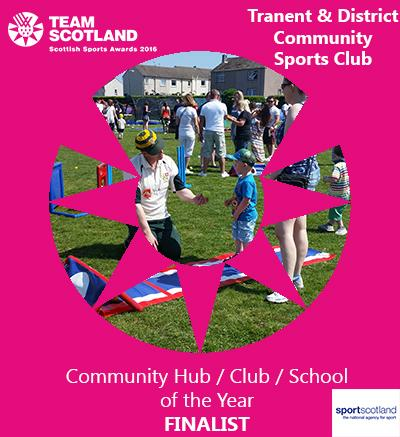 We are a bunch of passionate people dedicated to improving our community and were recognised for our efforts by becoming finalists in the Team Scotland Awards for Community Hub/Club and School of the year. This was a very proud moment for the hub and has only spurred us on to do more to improve the health and welbing of our community. The hub is made up of representatives of the member clubs: Tranent Juniors BFC, Ross High Rugby Club, Tranent Juniors FC, Ross High Hockey club, Tranent Colts, Tranent Cricket Club, Pencaitland Youth FC, Active Schools and Ross High School.